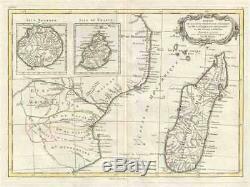 1778 Bonne Map of East Africa, Madagascar, Isle Bourbon, Mauritius (Mozambique). WE SELL ONLY ORIGINAL ANTIQUE MAPS - NOT REPRODUCTIONS JOIN OUR WEEKLY MAILING LIST FOR NEWEST STOCK. Title: Partie de la Cote Orientale D'Afrique avec L'Isle de Madagascar et les Cartes particulieres des Isles de France et de Bourbon. Description: A beautiful example of Rigobert Bonne's c. 1778 decorative map of southeastern Africa and Madagasgar. Roughly covers the territory current incorporated into Mozambique and Madagascar. Also includes inset map of the Isle Bourbon and Isle de France or Mauritius. This region of Africa held a particular fascination for Europeans since the Portuguese first encountered it in the 16th century. At the time, this area was a vast empire called Mutapa or Monomotapa that maintained an active trading network with faraway partners in India and Asia. As the Portuguese presence in the area increased in the 17th century, the Europeans began to note that Monomatapa was particularly rich in gold. They were also impressed with the numerous well crafted stone structures, including the mysterious nearby ruins of Great Zimbabwe. This combination led many Europeans to believe that King Solomon's mines must be hidden in this region. Sure enough our map shows the'Mts. Fuca riches en Or' in the western parts of Monomotapa. Monomotapa did in fact have rich gold mines in the 16th and 17th centuries, but most have these had been exhausted by the 1700s. A decorative title cartouche appears in the upper right hand quadrant. Bonne for issue as plate no. C 30 in Jean Lattre's Atlas Moderne. Size: Printed area measures 12 inches high by 16.5 inches wide. Some toning and wear along original centerfold. If your address is a P. DHL International EXPRESS (45 USD). We can use your Federal Express Account. Duty varies by country and we cannot predict the amount you will be charged. Some countries are duty free, others are not. Additional Services Conservation Framing Services: Geographicus recommends basic conservation framing services for any antique paper. We do not offer this service. Antique Map Restoration Services: Geographicus can repair and restore your antique map. Services include deacidification cleaning flattening and backing. The item "1778 Bonne Map of East Africa, Madagascar, Isle Bourbon, Mauritius (Mozambique)" is in sale since Monday, June 18, 2018. This item is in the category "Antiques\Maps, Atlases & Globes\Africa Maps". The seller is "geographicusmaps" and is located in 11221. This item can be shipped worldwide.